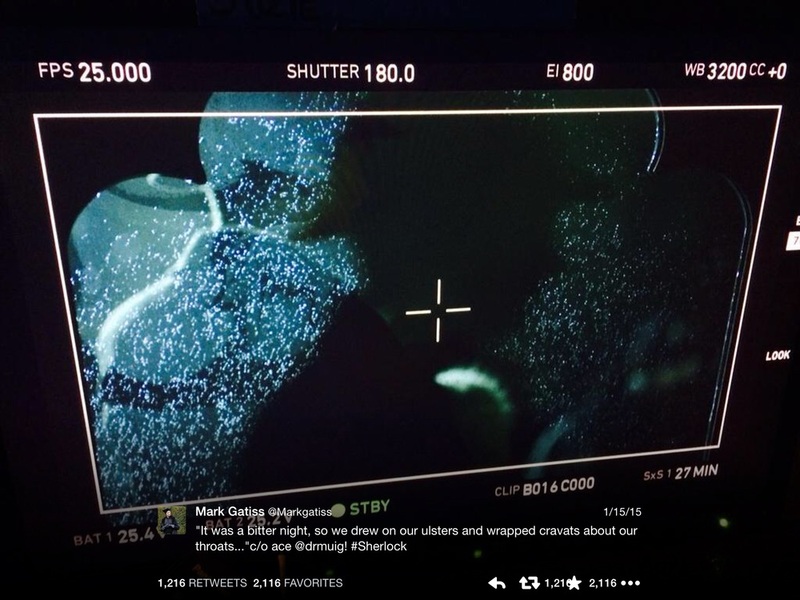 Sherlock writer Mark Gatiss, who also plays as Mycroft Holmes, has been tweeting here and there about the Christmas special that just wrapped filming. In addition to confirming the special will be 90 minutes long, Gatiss has also tweeted some pictures that hint at potential plot details. This cryptic picture is accompanied by a quote from "The Adventure of the Blue Carbuncle." The use of this story is not surprising considering it takes place on Christmas. It is hard to tell what the picture is, but there appears to be a silhouette of man. Based on the promotional pictures we have seen of Sherlock and Watson, it is possible the silhouette could be Sherlock or John Watson. For those who are familiar with the Sherlock Holmes canon, this is an obvious reference to "The Adventure of the Red-Headed League." This picture is not as straight forward as the previous one. This may be a nod to Sir Arthur Conan Doyle's place of burial, the Church Yard at Minstead in the New Forest, Hampshire, England. The "Millionaire Philanthropist" part is a bit more confusing. It could be a reference to the non-canonical pastiche novel Sherlock Holmes and the Man from Hell by Barrie Roberts, wherein a philanthropist is murdered. There is also a quote in A Sign of Four where Holmes tells Watson the most repellant man of his acquaintance is a philanthropist. One other possibilty might be a reference to "The Adventure of the Copper Beeches." In this story, Watson describes the mystery as being a question of whether their client's employers was "a philanthropist or a villain." The barrel is blocking a word. It is a short word, and the tiny bit of the first letter could potentiall be a D, leading one to believe the word is "dead." If the word is indeed "dead", then it is increasingly likely this is a reference to the novel by Roberts. One other interesting thing about this picture is there are copies of The Strand Magazine in it. This magazine was known for publishing fiction and puzzles and was the magazine that published Sir Arthur Conan Doyle's Sherlock Holmes short stories and a serialization of The Hound of the Baskerville. There are also red bands around the magazines with what appears to be advertisements for Sherlock Holmes on them. So, perhaps it is not a plot reference at all.